Yoga is the Bee’s Knees. Yoga means yoke or union. Let’s explore the union of yoga and honey bees. This will connect us from bees to gardening, Ayurveda, honey and different types of yoga such as bhakti and karmic yoga, even raja. Just as bees rely on each other, so do humans. We all share the same divine spark. Each individual matters, yet it is the unity of all that truly matters. It is the truth. It is sweet like honey to realize. It is golden. The honey bee has been fused in human history throughout the globe, mingling with religion and cultures. Let’s take a look at how they all honeycomb together. Bees are top pollinators for many of the plants on our beautiful Earth. If it weren’t for bees, our produce and food selection would be much sparser. Ross Conrad states, “Bees are one of the only animals I know that don’t hurt a single thing to survive. They take nectar and pollen that the plant wants them to have and turn it into these amazing healing substances—honey, propolis, been pollen, even stinger venom. I think they’re an integral part of a sustainable future because of their ability to heal.” (3). Many religions and cultures have held the bee in high esteem. In Greek mythology, Zeus was born in a cave sacred to bees and sustained by honey. Worship of the Great Goddess has been linked to using a bee as a cryptic symbol. The Great Mother was referred to as the Queen Bee. Christianity has meanings associated to the image of the bee. The bee can symbolize the Christian, the hive representing the Church. Bees can signify immortality when carved on tombs. In Hindu religion, bees are seen as an emblem of resurrection. This can be understood by the bees disappearing during the winter, only to reappear in springtime. Different gods are indicated with varying symbols including a bee. Krishna is indicated by a blue bee on the forehead, Vishnu is with a bee on a lotus, and Shiva is symbolized with a bee over a triangle. Islamic medical literature has emphasized the connection of honey and the Quran. “The medical literature states emphatically that any healing substance in and of itself will have scarce benefit without the necessary ingredient of faith.” (2). Folklore involving bees spans many countries. Bees helped young men find their bride according to fairy tales of Europe and China. The Celts saw the bee as a representation of secret wisdom from the otherworld. Herbs that are especially helpful to save the bees include: lavender, catmint, sage, cilantro, thyme, fennel, borage. Perennials include: crocus, buttercup, aster, hollyhocks, geranium, snowdrops and anemone. Some annual flowers that attract bees are: poppies, heliotrope, cleome, zinnias, sunflower, sweet asylum and calendula. Dandelion is important for bees, as well. It grows earlier and later than many other “bee favorite” plants. 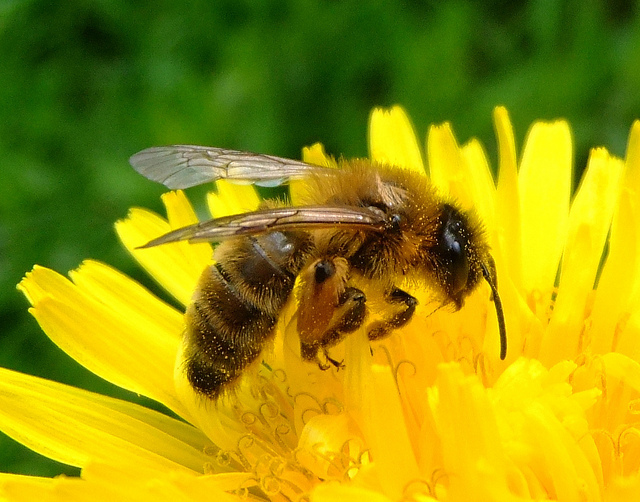 Dandelions benefit both you and bees. You can use some of the yellow beauties to make dandelion tea or add them to your next salad. The list could easily contain more benefits, but the sample provided above should serve as a spark to allow those dandelions to grow! Remember to not spray any chemicals on your lawn or plants. It is completely up to the individual whether they want to consume honey due to a number of factors such as a vegan lifestyle. I will highlight what research has shown about the benefits and share the information with an Ayurvedic approach. Honey contains antibacterial and antifungal properties. Honey should not be heated above 104 degrees Fahrenheit. It is best to buy local, raw honey. Purchasing local honey is better for the planet and also better at treating seasonal allergies. Honing into your doshas can be helpful in leading a balanced life. Most natural sweeteners are considered cooling according to Ayurvedic medicine. This reduces Vata and Pitta doshas and increases Kapha. Bees pre-digest honey making it a warming sweet food. It is the only sweetener suggested for Kaphas as they tend to have a cooler nature. Different types of yoga, such as raja yoga, bhakti and karma yoga, can all connect to bees. Throughout the ages bees have been linked to divinity. Finding and connecting to the divine within and practicing the meaning of Namaste is essential to living your yoga. Often bee hives are in trees. A hive is typically within the trunk or limb of a tree, facing south so that the sun helps the thermoregulation of the hive. B. K. S. Iyengar likens yoga to a tree, constructing the eight limbs of yoga. The word raja refers to royalty. Bees have even been depicted on royal clothing. In an article in the Arlington Advocate it is stated that Charlemagne had bees embroidered on his royal robes. In Poland, it is said, a man was chosen to be king to the empty throne when a swarm landed on him. This promised a long and peaceful reign. (6). Bhakti Yoga is all about love. Loving bees by providing essential habitats is a form of bhakti yoga. We are practicing ahimsa (non-harming) by doing so. When we help the bees they in turn help plants to pollinate; when pollination occurs, humans and other animals are able to cultivate food. Everything connecting is the essence of life and love. Saving the bees and taking care of our earth can easily be linked to Karmic Yoga. Selfless acts of love take you on the path of any type of yoga, but can definitely be attributed to the philosophy of Karma Yoga. Karma is action and our actions are all that we truly own in this lifetime, as illuminated by Judith Lasater in Living Your Yoga. One way to feel connected to the bees and improve your pranayama is to perform Bhramari Breath. To perform this breathing technique: sit in a comfortable position with eyes closed. Bring your thumbs to the cartilage near the opening of your ear. Gently press inward on the skin to close the hole. Place your other four fingers over your eyes. Inhale through your nose and as you exhale allow a humming to come out. Almost like OM but with your mouth closed, teeth slightly apart. Such a blissful buzz! By taking care of the bees you are taking care of yourself and others. You are doing good for the world and spreading love. Yoga = Love. 2. Foster, J., & Kueny, K. M. (2007). From the Bodies of Bees: Classical and Christian Echoes in Surat al-Nahf. Comparative Islamic Studies, 3(2), 145-168. 3. Jacobsen, Rowan. (2008). Fruitless Fall: The Collapse of the Honey Bee and the Coming Agricultural Crisis. New York: Bloomsbury USA. 6. O’Toole, Christopher. Bees: A Natural History. (2013). Buffalo, New York: Firefly Books (U.S.) Inc.
7. Robson, D. (2012). What’s the buzz?. New Scientist, 216(2892), 42-45. 8. Seeley, Thomas D. (2010). Honeybee Democracy. Princeton New Jersey: Princeton University Press. 9. Snyder, Michelle. The Arlington Advocate. (June 7, 2012). Hearing the song of the bees – The symbologist. 10. Tautz, J., Sandeman, D. C., & Heilmann, H. R. (2008). The Buzz About Bees : Biology of a Superorganism. Berlin: Springer. Interestingly, I have a love-hate relationship with bees. They give me panic but at the same time I love them because they produce fantastic products like honey o propolis. Charlene Wells holds a Bachelor’s degree in Library Science and a minor in Native American Studies. The power of nature and yoga have had a large influence on her life. She brings all eight limbs of yoga to her practice, allowing the alchemy of yoga to happen. She studied and received her 200-hour teaching at Seaside Yoga Sanctuary, voted the best yoga studio in Monterey County the last four years. 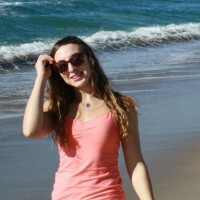 Connect with her through her blog, Instagram, and Facebook.